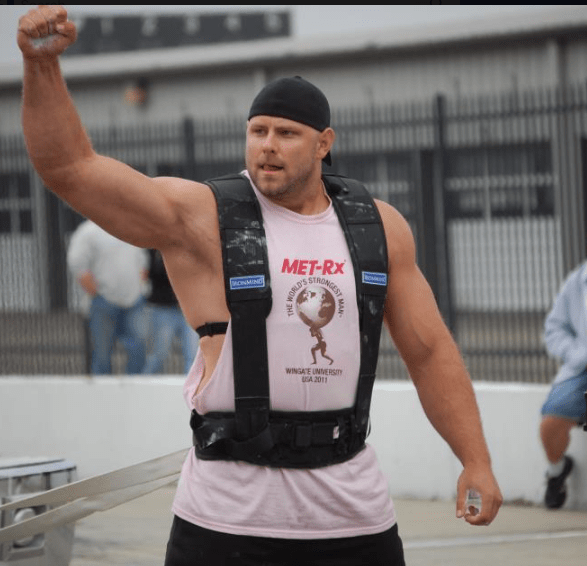 I have been in competing in Strongman for 14 years. In that time, I have competed in over 60 competitions all over the world. More than 50 of those have been pro competitions. 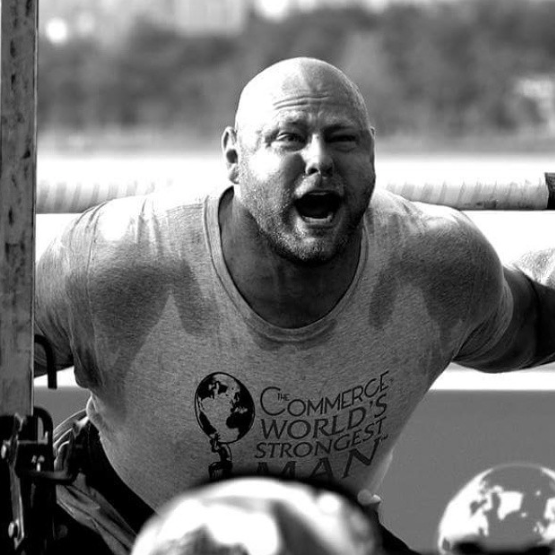 I have qualified 5 times for the World’s Strongest Man competition and competed in 4 (I sat out 2012 with an injury). I have been fortunate to stand on many podiums in internationals competitions. Along the way though, I have made many mistakes, and learned a ton. Many times I have been asked what I would do differently in my Strongman career if I could go back. I thought it would be good to share with everybody else here. Hopefully some of these messages will help others a long the way. If I could go back, I would be more patient in my Strongman career. I would have been ok with slow progression and reaching small goals. I always felt like I didn’t have enough time for small increases. For some reason I thought I only had a limited amount of time in the sport, which is true for all of us, but here I am 13 years later, still competing. Had I been ok with reaching small goals and progressing nice and easy I would have avoided injury, and not gotten as burned out along the way. I think the best example in the world of doing it properly is Zydrunas Savickas. Zydrunas’s training hasn’t changed much for 20 plus years in the sport. Each training cycle he just adds a little bit of weight. Over time all of those small increases have equated to the Strongest Man in history. Now at close to 40 he is stronger than ever. It has taken me a long time to realize this, but now that I have I feel better in training and competing in general. I understand that every training session doesn’t have to be a 20 pound pr. The key is steady consistent training year after year. It’s all about sticking with it and in time, you will be where you want to be. If I could go back I would have focused much more on flexibility. Stretching for the most part was non existent early on in my training. I was always athletic and quick, so I just relied on that in order to keep me going. The problem was that as my training and body weight got heavier, and I got stronger, that athleticism began to diminish, and I started to have more and more aches and pains, especially in my back. I have found that for me the single most important spots to keep flexible were my hamstrings and glutes. This is common for many people, and it often is what leads to back problems. The difference in lower back pain is night and day now that I try to keep my those areas loose. In contests I use to think about what other guys could do and compare my numbers and try to figure out how it would all play out in the competition. Many people do the same, especially when you see videos online from other competitors. But all of this is pointless. The only thing you can control is yourself. The only thing that matters is what you can do in training and on game day. This is your journey, not anyone else’s. When you see someone else doing more weight than you on something you can simply use it as motivation for yourself. You just keep your head down and keep training. Focus on reaching your own personal goals and you will be much happier in this sport. When I originally got into the sport I got into it simply because I loved it. I had so much fun training and competing. I would love the rawness of picking up a stone, or a wooden log. I felt alive when I would be outside lifting crazy things and feeling the adrenaline rush. Somewhere along the way it all became more stressful. Maybe when money came into the picture things changed a little bit. Going into a competition stressed out like this makes both your mind and body cease up and your performance suffers. When you go in loose, having fun you perform at your best. Always remember to enjoy the sport. Yes competition is fierce, and you should be focused, but this sport is way too difficult to not be having fun doing it. This is one of the things that I really learned from the European athletes. The Europeans take recovery very seriously and do things daily to make sure they are getting the most recovery possible. Rather than just sitting around and resting, Europeans are always swimming, going for walks, stretching, getting massages, doing hot and cold therapy, saunas etc. These types of things really help speed up recovery by increasing blood flow, flushing out lactic acid, digging out knots and digging out tight spots in the body. Active recovery is common place amongst athletes all over the world, but in my experience American strength athletes have a tendency to just rest completely. I truly believe that the better option is to do something that will generate a better recovery environment than just total rest. Total rest tends to make the body tighten up, and the lack of circulation tends to keep lactic acid in the muscles and not get the vital oxygen to the muscles needed to help recover and rebuild muscle. Some of this is done in the Cube Method For Strongman with agility work. It is important to remember that these days are not just for agility but a way to keep the body moving on non-training days. Although I do have a day in training where I simply rest completely (Sunday) all the other days I am at least doing something for active recovery. Even on a training day I do active recovery such as stretching post training, swimming, hot and cold therapy etc. I would have incorporated a lot more of this in my training early on in my career, as I have felt the benefits once I started doing more of this. Although things don’t always go according to plan, it is still good to try and map out what you would like to do in strongman and by when you would like to do it. Most of my career I did not do much planning. The way to do this is map out short term and long term goals and write them down. It has been shown that people who write down there goals are more likely to reach them than people who do not. For example you should pick out a contest and say I want to place top 5 or whatever your goal may be, then map out what it will take to reach that goal in your training, nutrition, recovery, and life in general, then fight like crazy to accomplish it. Do this with your training as well. You can say I would like to hit this much weight on deadlift by this time, and then you do whatever it takes to reach that goal. You should also have long term goals, where you say that you would like to be at a certain place in your career, i.e. turn pro, top 3 at nationals win world’s strongest man, it doesn’t matter what it is, but put a date on it. Then as you consistently reach your short term training and competition goals along the way you will eventually reach that long term goal. For some of you reading this it may seem obvious, but if you are like me it does not come naturally to you. My mind does not work in an organized planned out process. I have to force myself to plan and organize things out. A little bit of planning can go a long way in your training and career. This may not be something I would do differently as I feel Like I have always been like a sponge when it comes to learning, but it is a valuable lesson none the less. It is my experience that the people who know the least in the sport, are the least open to learning from others, and the ones who know the most and are the most accomplished, are the most open to always learning. That’s right as baffling as it is, often times the least experienced guys already feel like they know everything. But I can promise you if I saw something in a fellow pro strongman’s technique, or program or whatever that could benefit them they would be willing to listen. 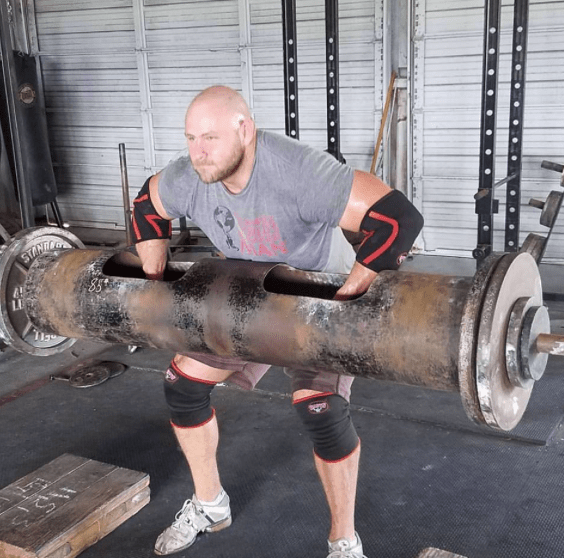 Even Brian Shaw or Zydrunas Savickas are still willing to learn, as they are always open to getting better and hearing new things. Always be willing to learn more, and improve, because frankly there will never be a time that you know it all. Early on in my career if an event didn’t go my way, especially at the beginning of the contest, it would affect the rest of my contest. I would really get down on myself, and get very pissed. Of course part of that was because I expect a lot out of myself, which is a good thing, but I would let it get to me when I didn’t do well. You should have a short memory in this sport. One bad event does not determine your competition, or your career. I have in time learned to put such bad events behind me and move on to the next event. I now use it in a positive way as motivation for the rest of the events. I have seen many times in competitions where an athlete will take last in the first event and still keep his focus, keep fighting and still come back and win the contest. Just look at Phil Pfister at the 2006 world’s strongest man. Phil did not place very high on the first two events. With Mauriusz Pudzianowski in the competition, it looked virtually hopeless that he could win. The only way Phil even had a chance was to win the final 5 events. And that is exactly what he did. Rather than let the first two events get him down, he remained steadfast on his goal, and fought harder than ever. He remained positive. I can remember before the competition Phil saw the WSM trophies in one of the hotel offices. He pointed at the Gold trophy and said, “There is my trophy.” He had already made up his mind that nothing was going to stop him, not even a couple of bad events. His prophecy came true, and he became the first American to win World’s Strongest Man since 1982. This principle holds true no matter what level of competition you are in. Remain positive during your training, competitions and about your future goals, and eventually you will have positive outcomes. These two things can go hand in hand. It is an absolute necessity to acquire as much equipment as possible in strongman. Sometimes this can be done by finding a training crew near you that already has the equipment, or by acquiring it on your own. Either way both things should happen, getting a training group, and getting equipment. When I first started competing, I had no equipment and no training partners. I showed up at contests and fought hard, but If I could go back I would of done whatever it takes to get some more equipment during those first 3 years or so. 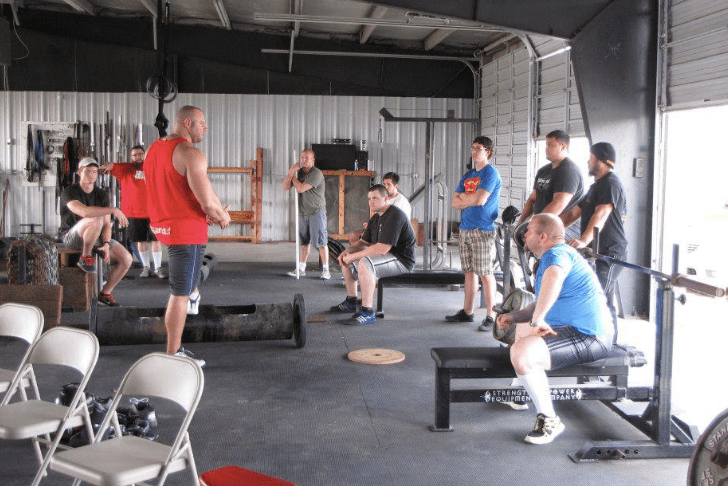 Eventually I found the unit training crew here in Houston which provided a great training environment with like-minded people and all of the training equipment I needed. To put it in perspective, for three years with no training equipment or partners I placed top 3-5 in most contests. 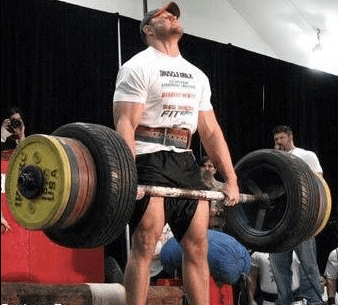 The second I started training on the equipment I won 4 contests in a row turned pro and was competing at world’s strongest man inside of a years time. I know for a fact that I would not have gone as far as quickly without that training crew and equipment. For one thing, all of this loading and unloading implements takes a while and is much more difficult to do on your own. But more importantly a training crew can push each other more so than you can on your own. You can compete with each other and motivate each other. The right training environment is invaluable. Make sure that the environment is positive, and conducive to improvement. A good training crew will encourage each other even if they are competing with one another. These days I mostly train on my own, but I would not be nearly as effective on my own had I not trained with a great training crew. In the beginning stages of your career it is imperative to get a group of like- minded people together. 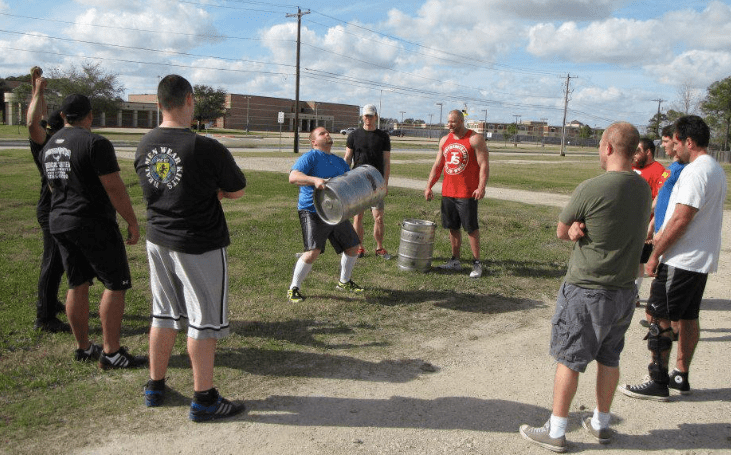 You can find a training crew or gym as well as learn how to make or acquire most strongman equipment Startingstrongman.com If you can’t find a crew near you, just ask some buds if they would like to join you for some training, get a crew together yourself. If you can’t afford to buy equipment, find out how to make equipment, but at all costs, get equipment. It is very important to determine exactly why you are in the sport. 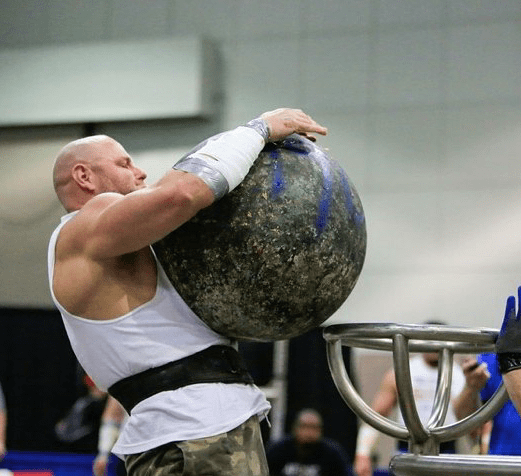 Some people do strongman as a hobby, and aren’t necessarily concerned with going to world’s strongest man, while others have a goal of going as far as possible. Both reasons are equally valid and can only be determined by the individual. But be clear which one you are. If doing strongman is a hobby, then make it just that. Don’t sacrifice family, friends, a social life, etc. because of the sport. You must have more balance and keep strongman in its place. Now if your goal is to become the world’s strongest man, or go as far as you can then the truth is there are going to be some sacrifices made. I am not saying that you should sacrifice family at all, but something somewhere is going to have to give. The truth is balance is not the way to make it to the top in a sport. You must be completely devoted to the task. There can be no half effort. You will have to put aside binge drinking, partying, staying out late and not getting any sleep. You will need to organize your life in such a way that it is completely condusive to reaching your goal. These are just the facts. If you disagree with this then you may not have a clear understanding of exactly what it takes to become the very best at a sport. Assess your life and if you really feel like you are in a position to really make a run at your goals. But either way, figure what you are competing for.